We are always looking to try new, halal food products. When we were the Halal Food Festival a few weeks ago, we got to sample delicious food from many vendors we had never heard of before. 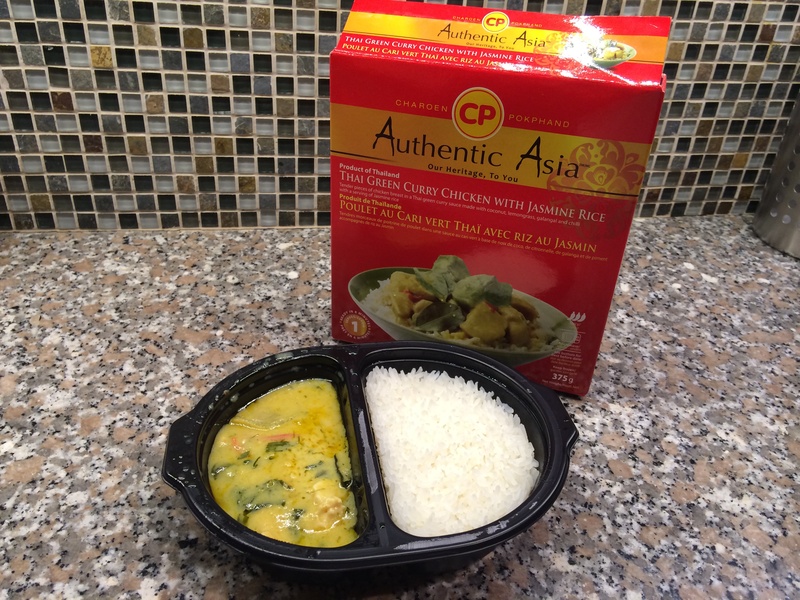 The one that stood out was CP’s Authentic Asia who introduced us to their frozen entrées. On the day of the Halal Food Festival, we had a few bites of their Thai Green Curry and Chicken Pad Thai and were amazed at the quality and taste of the food. We were told that these can be found in the freezer aisle of almost all big grocery stores. Not surprisingly, we were craving their food just a few days after and began our search in the freezer aisles at our favourite grocery stores. We were unable to find it at Sobeys but found it easily at Loblaws. We were tempted to try their entire selection of products but forced ourselves not to get carried away. We bought the Thai Green Curry Chicken with Jasmine Rice ($3.99) and Shrimp Wonton Soup ($2.50). The halal symbol can be found on the boxes but you may need to check all 6 sides of the box to locate it. We tried the Thai Green Curry Chicken with Jasmine Rice first. In just 5-6 minutes in the microwave, the entrée was ready to eat. The green curry was bursting with Thai flavours of coconut milk, basil and lemon grass. It was absolutely delicious and went really well with the rice. We did find the curry to be a bit on the salty side and the rice wasn’t as fluffy and light as we we would have liked. However, for a frozen dinner this was pretty darn good. The Shrimp Wonton Soup was ready in 3 minutes in the microwave. Don’t be fooled by the picture, the wontons were huge! Although there were only five wontons in the total, they were filling. The soup was well seasoned and the wontons were scrumptious. 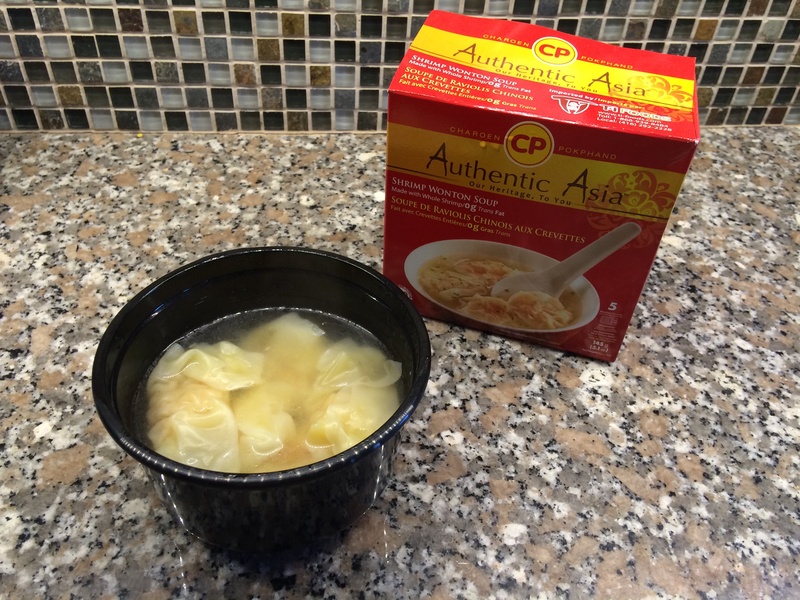 Although both products were great, we enjoyed the Shrimp Wonton Soup more. We look forward to trying more of Authentic Asia’s products, inshallah. Categories: Product Reviews | Tags: Authentic Asia, CP Authentic Asia Halal, Halal, Halal Chicken, Halal Food, Halal Food Enthusiasts, Halal Food Review, Halal food toronto, Halal Frozen Dinner, Halal Product Review, Shrimp Wonton Soup, Thai Green Curry | Permalink.